Mark commissioned an eternity ring for his partner. Together we designed this delicate 9ct yellow gold eternity ring with ten 2mm brilliant cut HSI diamonds . He also added a 1.2mm brilliant cut green tourmaline on the inside of the band. 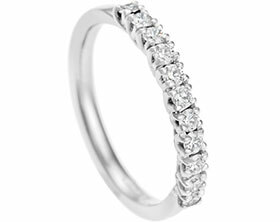 The ring has been given a polished finish to complete this delicate eternity ring.